Schoology is an online learning management system that allows you to view your child's graded assignments, view their upcoming assignments, and communicate directly with their teachers. NOTE: A parent account cannot be created from the website schoology.com. It must be created through the LAUSD parent portal as outlined below. NOTE: To first set up your parent account, you must be doing this through a desktop or laptop web browser, not a smartphone app. Once your account has been created and linked to your child, then you may use either a web browser or the schoology app to engage with the content. NOTE: After going through the steps of setting up your Schoology account for the first time, you may simply access Schoology directly from the Schoology website (www.schoology.com) and log in directly with your email address and password. 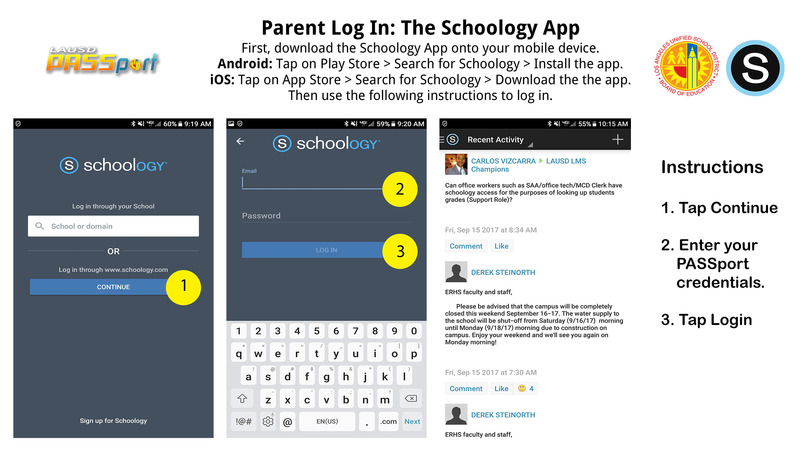 You may also download and use the free Schoology app for your mobile device (https://achieve.lausd.net/cms/lib/CA01000043/Centricity/Domain/720/parentMobileLogin.jpg).